This bikini set is a little more modest in the "Maior" style from Brazil. This bikini is a white and silver design and is very elegant. This is a very striking bikini in blue, light blue, and black. It has a shape that is more elaborate than most bikini cuts. This color combination is quite striking and sure to be a hit! Beautiful green-stoned bikini set in 3-D. Very elaborate! 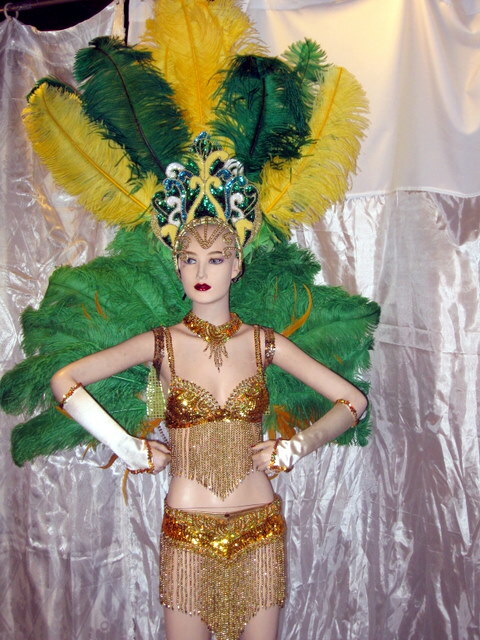 Features a Brazilian-Flag headpiece, a gold bikini, and beautiful green shoulder piece. HEADPIECE ONLY. A very beautiful orange bikini set with 3D headpiece and a unique bikini design. A striking bikini with a motif of fire and a very beautiful matching headpiece that is sure to turn heads. Beautiful and ornate headpiece with an intricate bikini in red and silver. BIKINI ONLY. THE HEADPEICE SOLD. 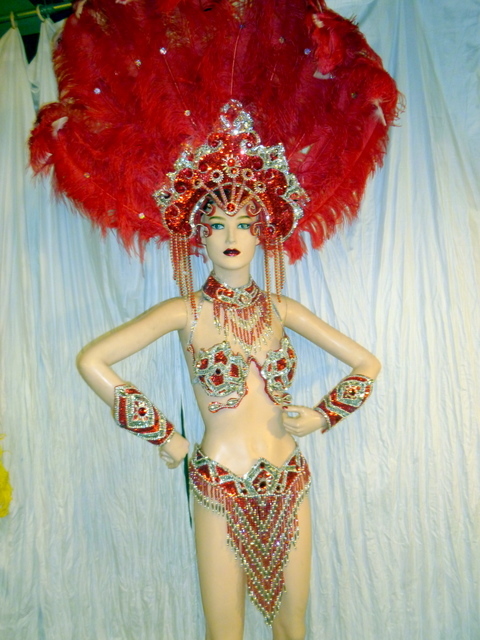 This is a very elaborate and ornate headpiece with a unique bikini design. BIKINI ONLY. Headpiece is sold. Beautiful white bikini set with very rare rainbow sequins that are white but reflect in a rainbow effect. See the wrist bands to see the effect in the photo. 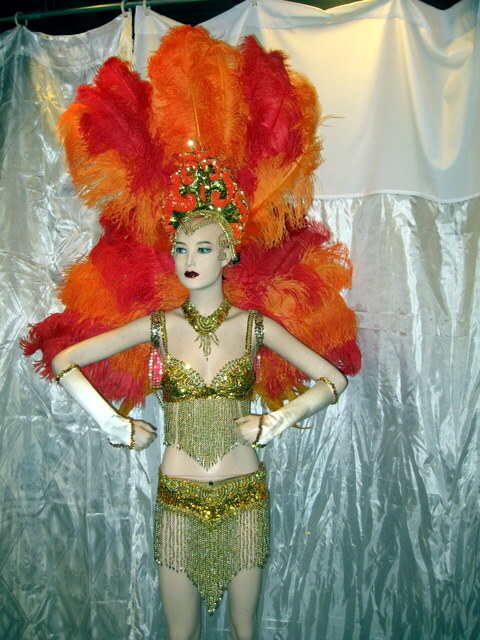 A beautiful "fire" motif in headpiece, bikini, and a stunning backpiece. An Afro / Brazilian inspiration by designer Doris de Hilster. It includes a very elaboratte backpiece. 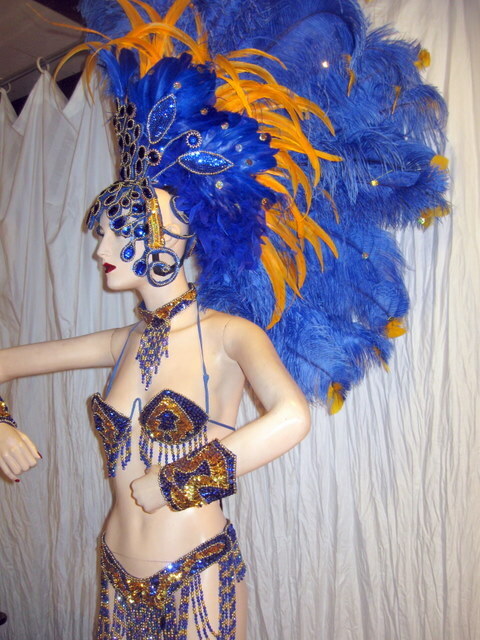 A stunning bikini set with a Mohawk style headpiece that can be worn in two different ways. A beautifully worked red and silver bikini set. Great price for those on a budget! Beautiful silver and green bikini set.